After pulling apart a NDSL, I know a lot more! Tracing out the connections, a lot of the LCD pins have a designator silkscreened on, which is totally awesome. I spent a bit of time tracing as many as I could, and then I internetted what I had. That led me to this amazing page, which has the rest of the pin names, but not a lot else relating to this. Totally rad information on other parts of the NDS and GBA systems, though. That is actually pretty close to the datasheet I’ve been working from. My analysis of where the screens differed was pretty accurate, too, which is cool. Figuring out the PCB footprint is also tricky from the component alone, and I made a couple mistakes in my earlier assumptions. Fortunately the PCB gave me a little more information, so this is the Nintendo DS Lite LCD connector. Which both gives me a datasheet, and a 50 cent source for more connectors instead of the Chinese manufacturers that market it specifically for the NDSL and charge $2. EagleCAD has a compatible library model from Omron with the model number “XF2C-3955-41A”. For the touchscreen connectors, they’re 0.5mm pitch, four contacts. That’s a pretty common sizing, and it’s not even a good idea to use the same connectors. That thing totally disintegrated the first time I looked at it funny. A quick search turns up a decent replacement in both top and bottom contact versions, depending on where I want to mount the connector. Eagle part number “52745-0490” from Molex. I like acronyms. They make me look smrt. Designing a board to mate with the Raspberry Pi is pretty straightforward. It’s mostly just a pass-through board. We need a footprint, though. As far as I know, there are no available PCBs out there that people have used the (nonstandard) Nintendo DS connectors on, so no footprints. First we try the easy way: Asking the manufacturers directly. That doesn’t work very often. Fun story: I once emailed an industrial control company looking for the models for some of their $5000 3-phase power supplies. Having the files would save me probably half an hour while laying out an equipment rack. Twenty minutes later, the customer support team emailed me the internal engineering model file. Complete with PCB model, populated with all components. I really really don’t think they were supposed to do that. I thought it was pretty funny. 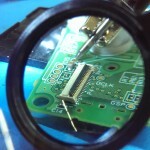 Here’s the LCD connector for the NDS screen. 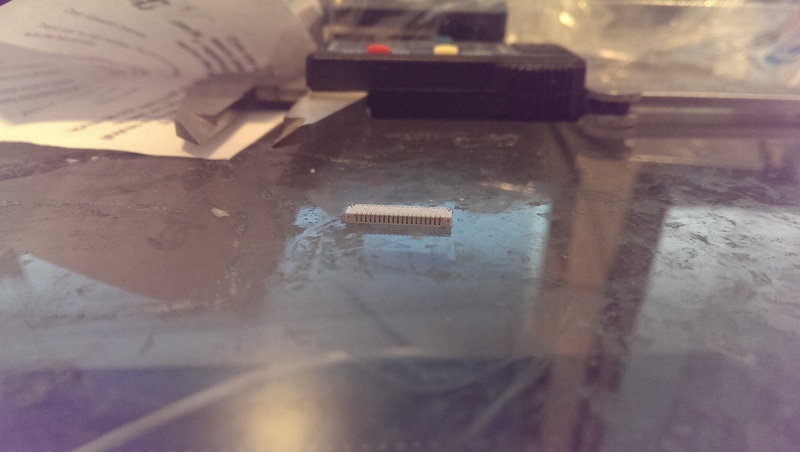 As you can (sort of) see, it’s 20 pins, and measured a little over 11mm from the first to last pins. With a connector that small, though, exact pitches are still hard to be sure about. And it’s two rows of pins. So we go through the Eagle parts libraries looking for something that might work. 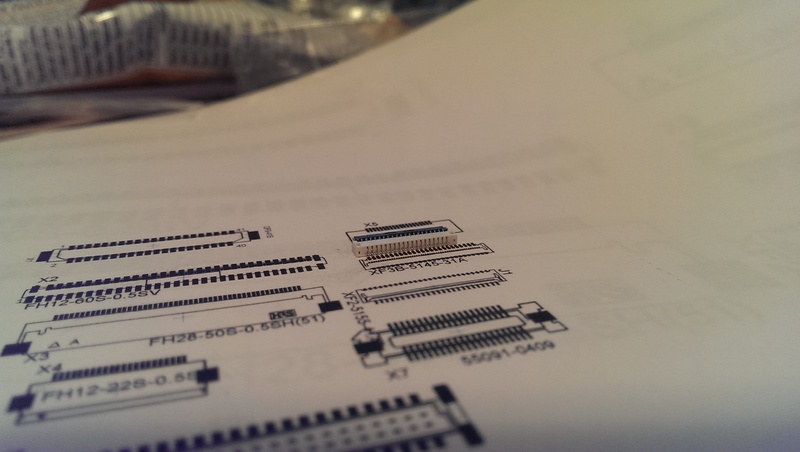 I kept my eye out for small-pitch 40-pin, double row connector footprints specifically, but I dumped a whole bunch of connectors onto the schematic that might work, after some changes. …Print it out 1:1 and see what lines up. I used to think that footprint-measuring PCBs were dumb, but I think I’m coming around. Would save me a few minutes and a little printer ink. 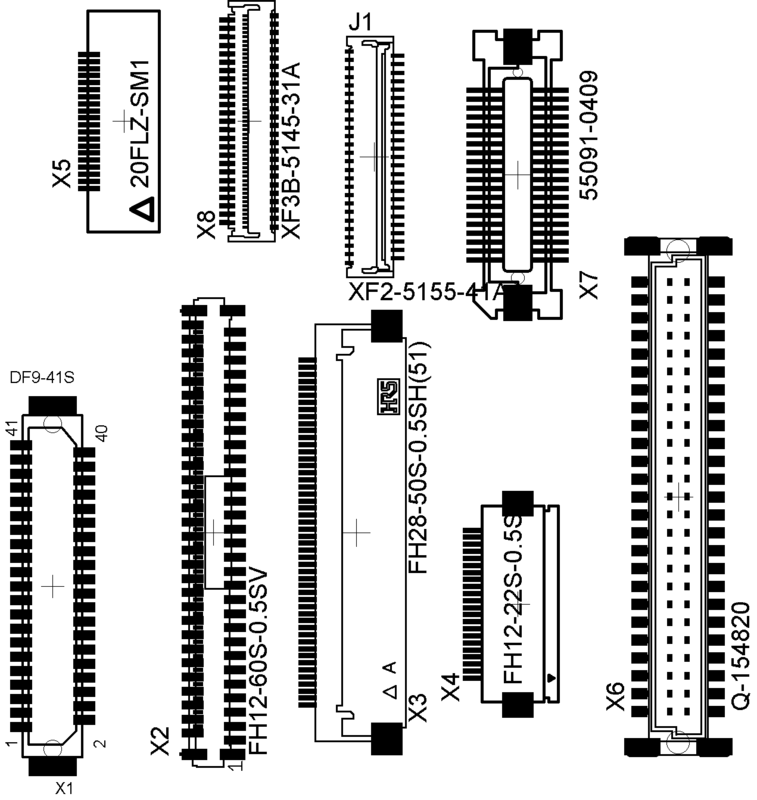 The pins lined up with (one side of) the connector labelled XF3B-5145-31A. It’s a 0.3mm pitch Omron connector. Good. Using that information, we draw up the new part, and Bob’s your uncle. I don’t know what that phrase means. Side note: The LCD flex cable is pretty standard, and I may try and find an alternate connector in the future. For this, right now, I just wanted a known-good connector and design a PCB around that instead of ordering a big bag of assorted FFC connectors off Digikey. After drawing the new library parts (touchscreen connector footprint, too, remember), I need to know how to connect everything. In this case, I have an LCD of uncertain properties, a Raspberry Pi GPIO connector of known properties, and a known resistive touchscreen. For the touchscreen, it gives an analog value (more on that in a future post), so we’ll need an analog-digital converter to get the values to the GPIO. I’m thinking the SX8652 or AR1011, we’ll see. Digikey has them both inexpensively. 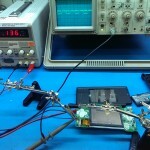 The TFT LCD is a little trickier. I wrote in a previous post that someone found a datasheet for the Sharp LQ030B7DD01 that looked similar, but now that I have the DS screen in my hands, I don’t think it is. From what we can see right here, there are 39 pins. Good. That huge plane that covers most of the top is probably ground, and is connected to pins 4, 18, 28. and 33. Not good. Assuming pin 1 is on the left, the pins don’t line up properly with any single node. Even if I have any of the above assumptions wrong, the datasheet lists pins 10 through 27 as RGB data lines. Pin 18 must be independent. If the right side of that image is pin 1 instead, the above problem still exists. 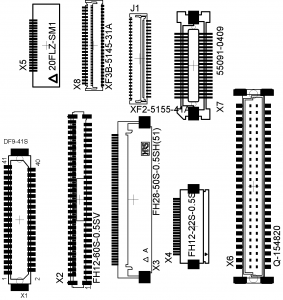 There are only 39 pins on the datasheet, so it seems possible that pin 18, near the centre, could be designated as an extra ground pin, but there are 39 physical pins that correspond to that datasheet, so there isn’t really any wiggle room here. On the right side of the picture, you can see pins 38 and 39 going to some large pads. Those loop around behind the visible flex cable, and then connect to that one you can see on the right. Looks like a backlight control, probably. Anyway. Those are the reasons I don’t believe this is the right datasheet, but fortunately, there is a “Sharp” logo on the back of the screen. So I do have a starting point for finding a better match. 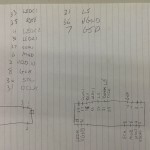 Going down the internet rabbithole, I found a German-language forum discussing the LCD, which linked to a now-defunct NDSL hacking site, which was conveniently backed up on the Wayback Machine at archive.org. During that bout of internetting, I came across an antitrust lawsuit that Sharp was involved with, price fixing these screens alongside Hitachi. That means that both manufacturers were producing LCDs with the same pinouts, so that gives me another lead to a possible datasheet. But anyway, it’s probable that the Sharp LCD is LS030B7DD12F, which has no datasheets available online. The Hitachi counterpart is probably 49N07020132, same story. I guess I need to actually track down a Nintendo DS Lite and really hack it. Damn.